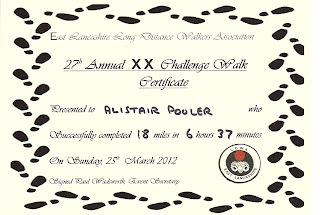 John J had been in touch a couple of weeks ago asking if I fancied coming along on an LDWA challenge walk in the West Pennine Moors, organised by the East Lancs group. I hadn't been on any sort of challenge walk for many, many years since I did the Dartmoor Ten Tors and the OATS walk several times between 1996 and 2000. However after a quick look at the route, I decided that I would enter the reasonable sounding 18 mile route. And so at 7am on the morning that the clocks went forward, i.e. less time in bed!, I was kindly picked up from home by John B and we drove to the start at Tottington Youth Centre, just NW of Bury, where we met John J, Viv, Martin and Judith along with many other walkers and runners. We were near the back of the group when we set off walking at 8am and began ascending gradually through the fields to the west of Tottington to reach the first cross of the walk: the Roman Cross in Affetside. From the cross we descended west for around a kilometre and a half, before crossing the A676 and picking up a track alongside the eastern shore of Jumbles Reservoir. Due to the lack of wind, the water was very still, which afforded good reflections of the trees on the banks. At the northern end of the reservoir we turned left over a bridge to reach the B6391 and the first checkpoint at Turton Tower. After passing the tower, which appeared to be covered in scaffolding, we crossed the Bolton to Blackburn railway line by an elaborate castellated bridge, before following the Witton Weavers Way for a couple of kilometres across the edge of the moorland. We passed a few people standing around their landrover looking puzzled as they had managed to drive off the track into quite a large hole and had seemingly grounded it; one of them appeared to be on the phone arranging some sort of rescue! Just after the dividing point for the 18 and 25 mile routes, we recrossed the B6391 and headed down to our second checkpoint at Turton & Entwistle Reservoir, where there was an impressively large array of food and drink available! By now the day was getting quite warm and it was time to dig out the suncream and sun hut. After a good break, we crossed the dam and past the Strawberry Duck pub to re-cross the Bolton to Blackburn railway line and then descended into the woods at the head of Wayoh Reservoir. From here we began our long ascent up to Bull Hill, initially by a muddy footpath, then road and track to reach our third checkpoint at Orrel Cote Farm. We then crossed the moorland of Edgworth Moor to reach Broadhead Road, from where we continued on a further footpath and then a minor road to reach the edge of Holcombe Moor. We crossed the reasonably level moorland for around a kilometre to reach the base of Bull Hill. From here the official route skirted the hill to the north, but I was keen to nip up to the summit having checked earlier in the week that there was no firing taking place as it lies on an MoD firing range. Therefore as no red flags were flying, we ascended up the twenty-five or so metres to reach the trig point on the summit of Bull Hill (HuMP). From the summit we descended following a small path to the east for a few hundred metres, before meeting the main north-south track across Holcombe Moor. Here we realised that we had missed the checkpoint by around half a kilometre! Therefore we headed north along the track, i.e. the wrong way!, to reach the checkpoint, which seemed to have a reasonably well stocked bar! However due to the heat, we all stuck to the water and jelly babies! We retraced our steps southwards past Bull Hill to reach the second cross of the walk: Holcombe Moor's Pilgrims Cross, where a couple of walkers were enjoying a refreshing beer in the sunshine. There was a refreshing gentle breeze on the moor, but it was still very hot for the time of year! Our route lay southwards over Harcles Hill, from where there were good views back northwards over the moorland and the steep southern edge of Black Moss. After descending into a small dip, we skirted the next hill to the east to reach Peel Tower, which was a very popular place to be today and there were some enterprising people selling cakes and drinks outside the tower. We descended down the hillside to enter Redisher Wood, where the ground steepened before reaching a bridge over a stream in the bottom of the valley. Here there were three horses dipping their feet in the stream and one of them was splashing a lot, presumably in an attempt to cool down! From the stream we ascended briefly, before following tarmac tracks and then a footpath to reach the final checkpoint of the walk at Spenleach Lane. We headed through farmland and through a golf course to reach Greenmount. After passing the church in Greenmount, and then a pub, we picked up a disused railway line for our final leg back to Tottington. This path was very popular with many people out enjoying the good weather. We crossed a viaduct over a reservoir before returning to the Tottington Youth Centre soon after 2:30pm, which was 6 hours and 37 minutes after we left. Here there was lots of food available and I had a large bowl of soup and a cup of tea. 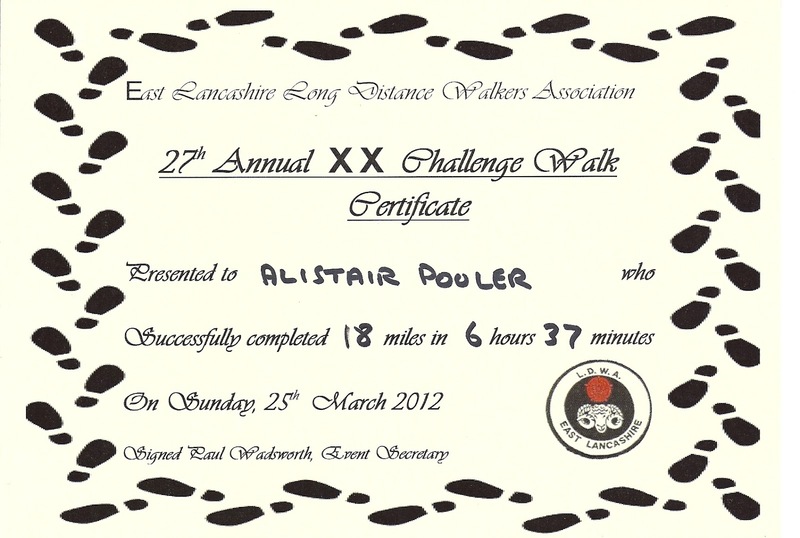 It had been an enjoyable day's walk and I definitely plan to do some further walking with the LDWA at some point. Update 01/04/12: Martin's excellent take on the walk can be found here and more details about the challenge walk can be found on the LDWA website (links also added at start of post too). Well done Alistair - a good and very prompt report. I'm impressed that you found the time to do it! Thanks Martin. I knew if I didn't write it up that evening I wouldn't get round to it for ages! Haven't been out that way for a long time. Had a New Year's day at The Packhorse in Affetside many moons ago and lots of Winter walks up to Peel Tower! I think it was only my second hill-walking visit to that bit of the West Pennine Moors myself, although I do intend to return at some point in the future. Well done on completing the challenge! And what a beautiful day fot it, as well. I'm not much of a fan of challenge walks myself, but of course each to their own. Looked like an interesting rather than gorgeous route. Thanks. And it was a lovely day, in fact I would say it was possibly a bit too hot! A grand day out I thought. Thanks for the correction JJ. It was indeed an excellent day out; many thanks for the invite!